The Google My Business Community is Dead… Long Live the Google My Business Help Community! Yes, the official GMB online community website has had a full refresh, and with it comes a raft of new features, easier ways to share issues, and even a board devoted to agency queries! Here’s Google Product Expert Ben Fisher to tell you all about it. The Official Google My Business Community is now Google My Business Help Community! The new community represents a much larger commitment by Google to integrate community help into the self-help support center. By community, they mean ‘users helping users’ (this can be a regular business owner an agency or a Google My Business Product Expert). You may not have known this, but the previous incarnations of the Google communities were mostly built on software created by other companies. With the recent change on March 28th, 2019, many Google products support centers now have an associated community, running on a platform developed and owned by Google. Previously the support section was completely disconnected from the community support. Now, with this evolution, all ways of requesting assistance are organized into one area. This is the screen you see when you visit support.google.com. Whether you’re representing an agency, a local business or a multi-location brand, to get the best GMB support possible you should first try searching or asking for help in the community, then if that fails you should use the support wizard. Confused? Fair enough. I get it, I really do. I know you want to talk to someone now, and a form is never going to truly understand your problem. I’ve even written an in-depth guide about contacting Google My Business support. The reason I’m recommending trying the community and support wizard first is that Google is collecting information that any support channel for Google My Business will need and it will give you an idea of what support will need from you. A great example of this is with verification. Most people don’t know that you need to wait 14 days before you contact support after requesting a verification card. Well, if you go through the community first you might find out that you have to wait 14 days from another user, while the support wizard asks if you have you waited more or less than 14 days, and then routes you to the proper channels based on your responses. If the support wizard and community answers are not enough, then you can head right over to social media support on Facebook or Twitter. Note how in this featured post, a user is encouraged to search the help center first before engaging in the community. So you searched the help center, maybe reached out to support and still feel a bit overwhelmed and confused as to what your next steps should be. Well, the good news is that you are not alone and your problem is not unique. This is exactly where the community comes into play. Millions of people use GMB on a daily basis. Some of us are power users (like the Product Experts) and others have had the same experience you have had and felt the frustration, so they now help others as well. More than likely, the problem you are having right now has been experienced by someone else, so this is where a community comes into play. 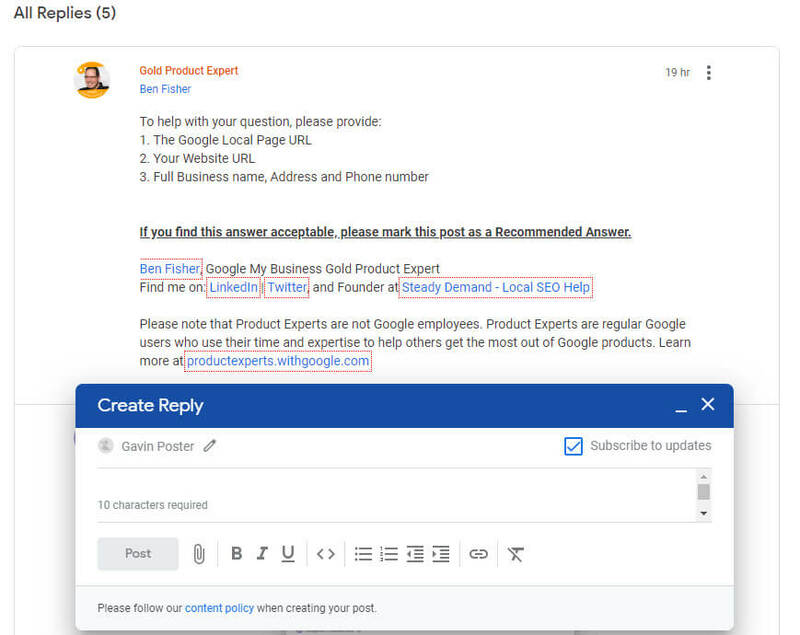 In the community you’ll be able to find your solution or a Product Expert (PE) can let Google know about your problem and help get it resolved. Note: If you are having a problem versus just a general question, it is worthwhile to search the help center, search or ask for help in the community then head to support if you cannot find your answer or if directed to. Let’s Talk About What’s New! TL;DR: Trending issues, mobile friendly, rich text editor, subscribe to updates, search and filter, recommended answers, categories. So, speaking of problems experienced by someone else, a new feature that I think is going to be helpful is the Trending Issue. If many users are having the same issue, the community manager can make the issue a trending topic so that many threads can be combined and the issue can have high visibility. Next up is the fact that this community is mobile friendly right out of the box. Considering how unfriendly the previous advertiser community was, this means that getting solutions on the go is going to be much easier. This also means that the increase in new threads will rise as well, so please come prepared if you have a problem. Now, this is pretty awesome! The entire community is built with material design and the new rich text editor is super slick! All of the features you need are a button-click away, from adding an attachment and stylizing text to creating links and even putting in code. One thing to note is the “Subscribe to Updates” checkbox. If you are creating or replying to a post, you’ll want to make sure this is checked since you can filter on this (more on filtering next) then you’ll be notified via email whenever someone replies or selects an answer as recommended. New search and filter functionality it is easy to use and very powerful. You’ll get to the search tool after you select ‘view all posts’ from the main page. As you can see below, with this simple-to-use interface you can sort by your activity (‘created or replied to’ and/or ‘subscribed to’), only see posts that have a recommended answer, only see featured posts, and sort by category. You can also filter based on platform (Android, iOS or Web). The next feature is more of a replacement. You used to be able to accept a solution if you were the creator of a post. Now you can recommend an answer. Not only can you recommend an answer, but you can recommend multiple answers. This comes in handy when multiple people have suggested ways of solving your issue and you found multiple posts that worked together well to help solve an issue. As far as I can tell, you can recommend as many answers as there are posts in a thread and multiple answers per user. Finding a thread particularly useful? Now you can upvote it! The API and spam forums are gone. ‘News’ was replaced by ‘Announcements’, ‘Articles’ were replaced by ‘Featured Posts’ and the help center. All you need to know as an agency or user of the previous advertiser community. Google cares deeply about the GMB product as a whole and has made a large investment into it and its users. This move brings the community front and center, along with the help center. There are a ton of new features, with more to come, and I am sure there will be some growing pains, but I’m excited for what’s next. How do you feel about the new community? Let me know in the comments.